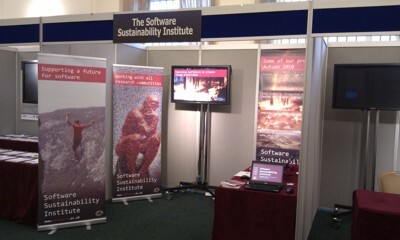 The Software Sustainability Institute stand is up and running at the AHM 2010 in Cardiff. We're the first booth you will see as you enter the exhibitors hall, and it's hard to miss us since our stand is decorated with tightrope walkers and human pyramids. There's a lot going on at the stand. To find out more about us, you can pick up a flyer or use one of the SSI laptops to browse our interactive powerpoint. If you have a question about software development, you can stop by the stand and 'Ask Steve' - our resident software expert, who will soon be answering questions on his own blog. You can stop by and pick up a pen or a "Death to Decay!" sticker. Or you could just drop by the stand and speak to Neil, Rob, Steve or Simon.